I READ a lot about scrapbooking, I PLAN a lot about scrapbooking, but I haven't DONE a lot of scrapbooking. 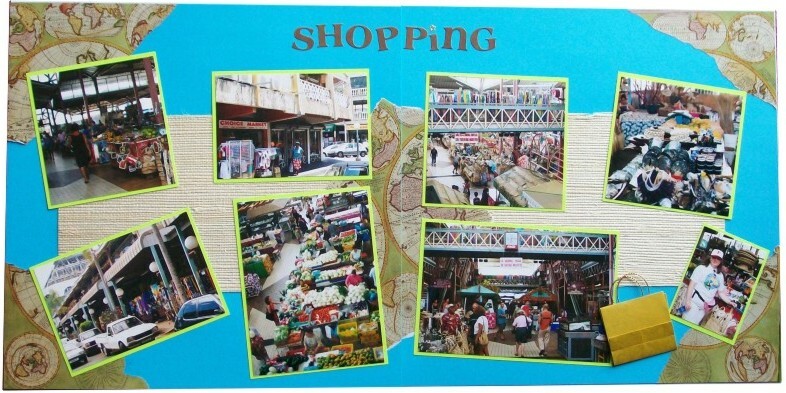 In fact, I have only done scrapbooks about our grand vacations (cruising and island trips). I do have a box crammed full of photos, binders, supplies, and ephemera from at least three other trips that I haven't gotten to yet. However, I thought I'd share some of the work that I HAVE done. This page is from a trip to Tahiti. One afternoon a lady set up crafts on the beach. How could I NOT go play. 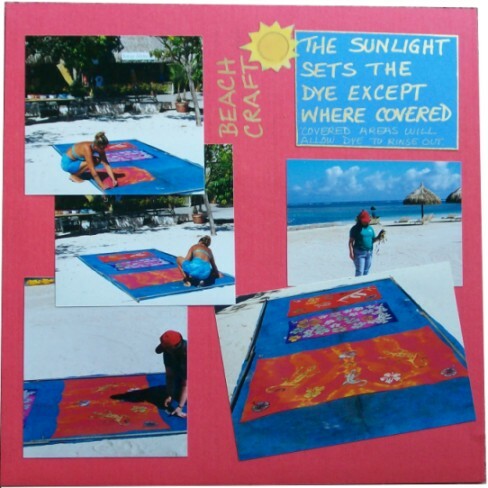 She made available sun-reactive dye, cloth, and plastic templates of island motifs. We soaked the cloth in the dye and staked it out on the beach with protective layers beneath. Then we placed our selected templates over the cloth and went to play elsewhere for an hour. When we returned we rinsed the un-exposed dye out of the cloth and our pattern remained in white on our colored background. I love the color combinations on this page. This next spread is also from Tahiti. The corners are from a calendar with antique map illustrations. The 'cloth' backgrounds are from a wallpaper sample book. I made the mini shopping bag from a Karen Thomas origami DVD. The photos were all matted with the same color to unify the spread. Everywhere we went on Tahiti and Moorea there were beautiful tropical blooms. I took lots of photos of them and combined them all on one spread for impact. 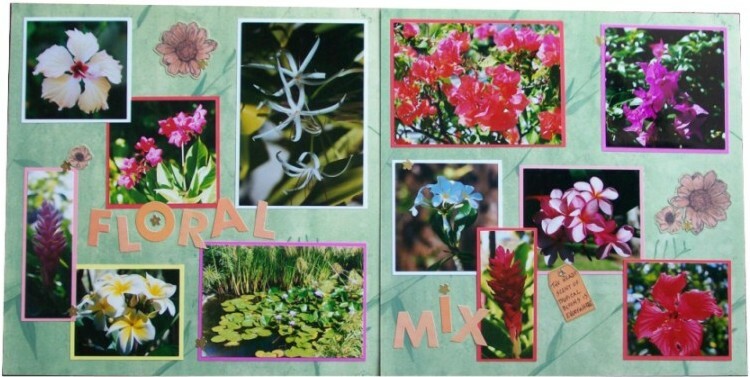 Each photo is bordered in the color of the flower. They are then arranged to separate the like colors from each other. I trimmed this up with pre-printed diecuts and punchout letters. Some of my friends have seen the following before, but for those who aren't on any of the Yahoo lists I subscribe to - here is an idea I had to rebind one of my scrapbooks. This is from our cruise to Alaska. 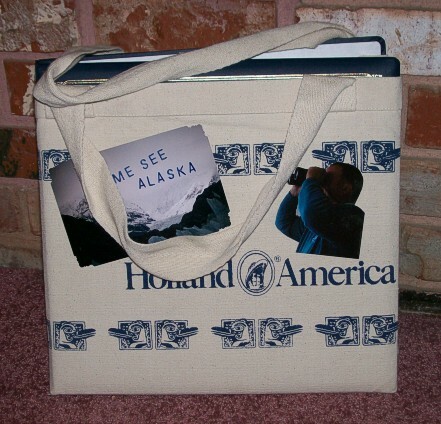 The cruiseline gives out these canvas shopping bags to each cabin and I have collected a number of them. 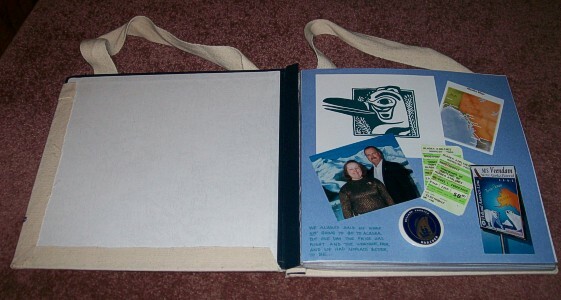 I tried to think of a way to include it IN the scrapbook but ended up cutting open the seams and using the front and the back separately to bind the covers of the scrapbook. When the book is closed it looks like a scrapbook IN a bag. But when you open the book the handles each go with their covers and the viewer is always surprised. 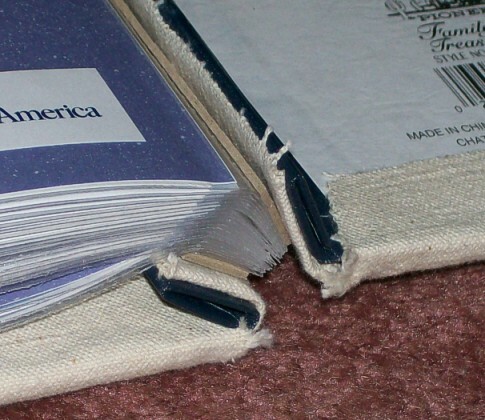 Here are views of the corners and of the spine showing how it all came together. I used Crafter's Pick The Ultimate glue. 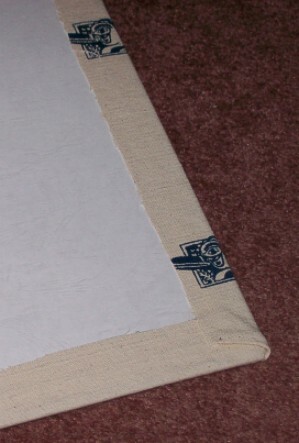 Only these inside edges are glued so the outside remains a giant pocket into which more stuff can be inserted.